For decades there wasn’t a lot of research on women’s heart health because most of the studies focused on men. Women’s health research was more plentiful on other illnesses and conditions, like breast and lung cancer. Though unintended, this situation was made more challenging because women often presented with different symptoms than men. For the treating physician, diagnosis was more difficult and often led to a more conservative line of treatment. In some occasions, a woman’s unique symptoms masked a more advanced development of the disease. THAT WAS THEN. WELCOME TO NOW. You might say that women have caught up with men in the arena of cardiovascular disease; but more correctly, you should say that medicine now clearly recognizes and treats cardiovascular disease as the number one killer of women in the United States. SOURCE visited with three cardiologists with the Heart Center for a discussion on women and heart disease. It so happens that each of these cardiologists is a woman—Rashida Abbas, MD, Navdeep Mann, MD and Patricia Gurczak, MD. All three are board certified in their specialty and are fellows of the American College of Cardiology. Abbas and Mann practice at the Heart Center’s Huntsville office and Gurczak is in the Madison office. Diabetes is just one of the many factors that increase the risk of developing cardiac disease. So is smoking, an unhealthy diet, lack of exercise, family history, and simply not paying attention to your numbers, like your weight, blood pressure and cardiac lipid levels. All three cardiologists pointed to atypical symptoms that are often experienced by women. “For women, it’s often shortness of breath or fatigue, not necessarily chest pain which is the primary symptom of many men,” said Dr. Mann. Further complicating the diagnosis and treatment of women is that some patients have disease involving the smaller rather than the major arteries. The presence of “microvascular angina” does not necessarily mean a woman has blockages in her arteries, but the symptoms can still be very real. These patients are often younger and can be treated with aspirin, statins (cholesterol reducing drugs) and nitrates (drugs for angina and chest pain), according to the physicians. Drs. Gurczak, Mann and Abbas agree that educating women on the risks of heart disease is a top priority along with taking steps to a healthier heart. 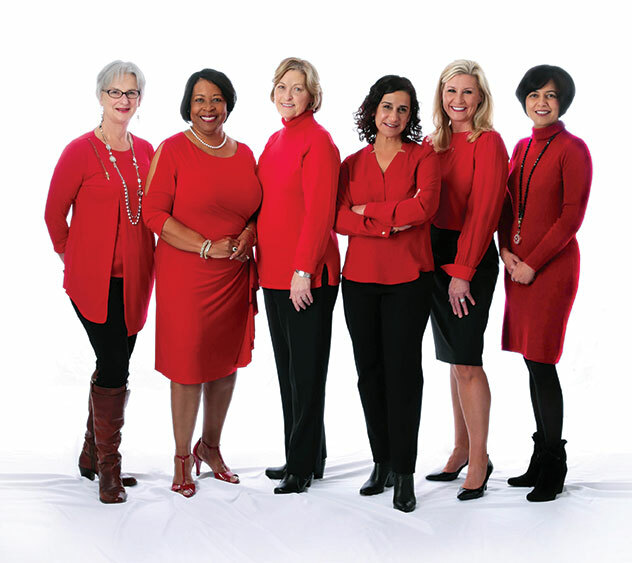 And that’s one of the reasons why Huntsville Hospital and the Heart Center are partnering with the American Heart Association in raising awareness of the risks of heart disease in women through the Go Red for Women campaign, the American Heart Walk, and the Heart Society Ball.